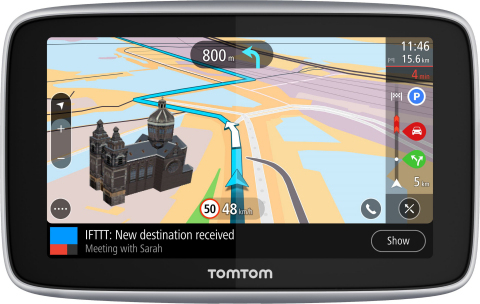 AMSTERDAM — (BUSINESS WIRE) — March 27, 2019 — TomTom, the location technology specialist, today announced the launch of the TomTom GO Premium – its most feature-packed, best connected, and smartest navigation device. This new state-of-the-art satnav, built with safety in mind, assists drivers throughout their journey from before they get in the car, through to the last few steps to their destination. The TomTom GO Premium, with TomTom’s powerful navigation and traffic information, comes with some incredible new features like IFTTT (If This Then That) integration, so drivers can stay connected to all the things that matter in a connected world. IFTTT functionality lets the TomTom GO Premium connect to home devices, interact with personal digital assistants, sync appointments, and get notifications. For example, when you arrive home, the gate or garage door will automatically open, and when leaving the house, the lights will switch off. TomTom GO Premium is designed to make every journey more enjoyable. Before getting into the vehicle, built-in Wi-Fi® will ensure that the software and maps are up-to-date, while the driver can use the TomTom MyDrive companion app to pre-plan their route, sending their destination to the device. During the drive, the TomTom GO Premium can share location and arrival time with contacts*, and once the destination has been reached, the satnav hands over to the TomTom MyDrive app to direct them on foot to the true final destination. And now there’s no need to worry about forgetting where the vehicle is parked, because the app will remember. The new TomTom GO Premium is being launched as the company celebrates a major milestone: 100 million TomTom navigation products sold. To celebrate, the device will come in both a standard and special edition called TomTom GO Premium X which comes with a brushed gold finish and is only available on TomTom’s website. The 5” or 6” fully-interactive touchscreen TomTom GO Premium is available in Europe on TomTom’s online store, at selected e-tailers and in-store for €329.95 (5”) / €379.95 (6”).